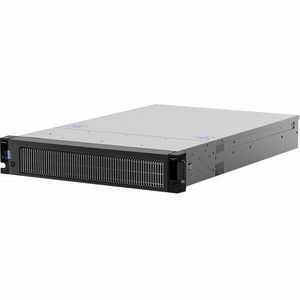 ReadyNAS 3312 and 4312X are powered by a 5th generation Intel Xeon Enterprise Server Processor . The RR4312X has two built-in 10Gigabit Ethernet interfaces to meet the throughput speed of next generation network in businesses of all sizes. Application data, virtual images, client files, email... the types of data central to running a successful business can seem endless. With ReadyNAS ® you finally have an advanced and easy-to-use solution for centralizing, securing and controlling access to your digital assets. Way more than just simple unified (NAS and SAN) storage for your company, ReadyNAS allows you to do more than you ever thought you could afford by pairing the latest in performance with innovative efficiency technologies such as unlimited snapshots, thin provisioning and cloud-managed replication. Every networked attached storage (NAS) device from NETGEAR runs on the revolutionary ReadyNAS operating system. This custom-built OS protects stored data with XRAID2 ™ automatic expansion and offers continuous data protection with unlimited snapshots. Real-time anti-virus and native encryption comes standard. The RR4312 Series offers two built- in 10GbE ports, requiring no additional installation and offering compatibility assurance. Designed specifically for the unique needs of business users, ReadyNAS devices utilize proprietary ReadyCLOUD ™ technology for cloud-based discovery, provisioning and ongoing management. In addition, these devices are virtualization-ready with iSCSI support, thin provisioning capability and certification with VMware ® and Microsoft ® .